I actually haven't baked any macarons for a while - I've just neglected to tell you about these ones! The shells are flavored with cocoa powder (and I always find those more prone to cracking, so don't worry if yours do, too.) The filling is a basic buttercream, with instant coffee granules and cocoa powder. I was worried that the coffee should have been dissolved rather than just stirred in, but as it happens, it was perfect this way. The granules retained a little crunch, and more bitterness, which was very pleasant in contrast with the sweetness. I'll make another batch of macarons soon though, because I got a very special piece of equipment to try out! It's a silicone baking mat specifically for macarons, by Lékué. (I got mine for review from Ninas Mat.) In theory, it looks great - perfect for making all your macarons the same size. I'm excited to see how they turn out though, I'm a little worried that the mat itself will prevent the shells from rising properly... but we'll see! Bake at 150°C for 10-12 minutes. (I constantly vary this time, depending on the batch. I use a convection oven.) Let them cool completely before filling. Unused shells can be frozen, or kept in an air-tight container for a day or so. Add the butter, a pat at a time, until fully incorporated. Divide the finished buttercream in half - you can save one half in the fridge or freezer, but you might have to re-beat it before using. Add cocoa and coffee to the half you'll be using. I look forward reading the silicone mat review! Wow! 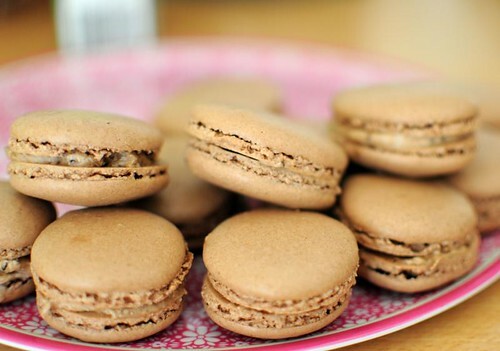 I have leftover egg whites from making ice cream, so macarons seem to be on my "To Do" list soon! I see you would like some Honey-Roasted Cashews, if you like I could perhaps send some to you, along with anything else you perhaps fancy from the UK, perhaps a Christmas Pudding! I will be in Malmo in November so I could post them from there to Stockholm to keep the cost down for myself (I am not asking for anything in return!) I am really enjoying your blog and writing especially as I am a fan of Swedish, Swedish life, Swedish food and trying to learn to be a better cook! I usually end up bringing back more in Swedish food than in the clothes I take on holiday!